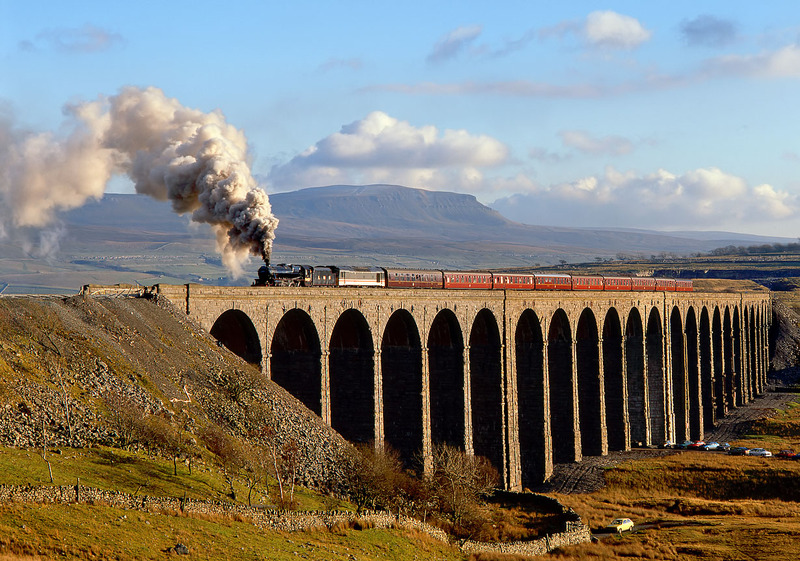 'Black 5' 5407 crosses Ribblehead Viaduct with a northbound railtour on 25 November 1989. This was the era when steam photographers were outraged at the inclusion of an ex Class 25 Ethel (Electric train heating ex locomotive) in the consist, made worse by the fact that it was painted in InterCity livery! On this occasion 97252 (ex 25305) is officiating. The Settle & Carlisle and fine weather are not normally something I associate, the weather in the fells always seems to be poor when I venture up there, even when there is unbroken sunshine everywhere else! However this late autumn day proved the exception and provided a number of excellent pictures.